Weather 2000 values its active role with community issues from local to international. To strengthen the essential connection between science and society, Weather 2000 scientists volunteer and participate in a wide spectrum of activities. We would be happy to visit and participate with your community organization, school, or club. Please feel free to contact us to make arrangements. Director of Forensic Meteorology, Thomas Downs, serves on the Newspaper's Community Editorial Board, which addresses issues that impact the local area. Weather 2000 contributes research and is interviewed by Spike Lee for his Documentary on HBO. Discussed are the risks to coastal communities posed by hurricanes and sea level rise, as well as future threats to the big metropolises of Washington D.C., Boston, and New York City. Weather 2000 was pleased to offer insight on the placement of wind turbines atop the future Freedom Tower. Weather 2000 was asked to advise NYC2012 on weather characteristics and likely conditions for the Olympics and proposed event venues. Chief Meteorologist, Michael Schlacter serves as Vice-Chair of the Atmospheric Sciences Section of the NYAS. October 23rd, 2003 - Weather 2000 invites New York State Climatologist Mark Wysocki to give a presentation about the weather on other planets. October 24th, 2002 - Weather 2000 presents New York Winter Weather facts and statistics as well as their latest Fall and Winter 2002 predictions. May 16th, 2002 - Weather 2000 helps organize important Drought Forum for New York Metro area. Chief Meteorologist, Michael Schlacter was appointed to the Next Generation American Committee. July 2nd, 2000 - Michael Schlacter discussed hurricane potential for Florida and climate scenarios for the U.S. in a presentation for the South Florida Region Ambassadors Conference in Palm Beach, FL. Manhattan's Bryant Park has teamed up with Weather 2000 to provide updated and customized daily weather forecasts for park-goers. Weather 2000 assisted New York City's Bryant Park in establishing its first operational weather station. Additionally, Bryant Park's facilities are periodically used as an alternative site for New York City snowfall observations. Earth Day New York - Weather forecasts and advisories for events on Earth Day. The US OPEN - Customized weather forecasts, continual monitoring, Radar and inclement weather updates for the annual tournament in Flushing Meadows. The Macy's Thanksgiving Day Parade - Wind and weather forecasts and suggestions related to the vagaries of urban weather. Meteorological research for ABC's "Who Wants to Be a Millionaire? ", acting as fact-checker of weather related questions aired on the show. Current weather conditions, radar, and satellite images for New York City were compiled and archived for September 9, 1999 at 9:09AM EDT. The Hudson River Museum - Weather 2000 assisted on a meteorological observation project, sponsored by the Hudson River museum. 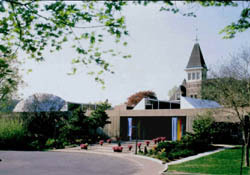 The goal of the project was to establish a weather observation station and computerized network on the Museum's Yonkers-On-Hudson property, to help the students learn about the weather in their neighborhood. We are presently involved in similar projects around the area. Weather 2000 has teamed with Edison Electric Institute's (EEI) Alliance of Energy Suppliers to provide its constituents with meteorological information and educational resources for Weather Risk Management. Weather 2000 has partnered with Golf Solutions.com to supply weather forecasts and information to their members and clients. Golf Solutions.com provides quality internet services to golf course superintendents across the country. Weather 2000 is a proud member of the 34th Street Partnership. Weather 2000 has established an annual sponsorship fund for Cornell University Meteorology majors. In its ninth year, the scholarship is allocated into academic, forecasting, and class trip categories, and we hope it will enrich the educational experience of all students and faculty. Weather 2000 was proud to support the 6th Annual Cardinal Hayes Invitational Track & Field Championships in Bronx, NY. With the speed of the Internet, damaging misinformation can spread rather quickly, with very few checks and balances. At Weather 2000, we strive for the highest level of scientific integrity in everything we do, both in and out of the workplace. Practices to the contrary, which do exist, are only damaging to the scientific profession. Weather 2000 has teamed up with academic institutions and research scientists to combat pseudo-meteorology, insure scientific integrity and protect the public's interests. For more information, please see our FAQ, and specifically our section titled Scientific Integrity in Weather Forecasting. * - All logos are registered trademarks of their respective entities.